Harrison Michigan provides many recreational opportunities, Camping, Wilson State Park, Canoeing the Muskegon River, Fishing in the many area lakes and trout fishing in the Cedar or Clam River, 4th of July Celebration at the County Fair, Many community events, & Riding on the may ORV and Snowmobile Trails. For more Harrison MI. Information, please visit the Harrison Chamber of Commerce. 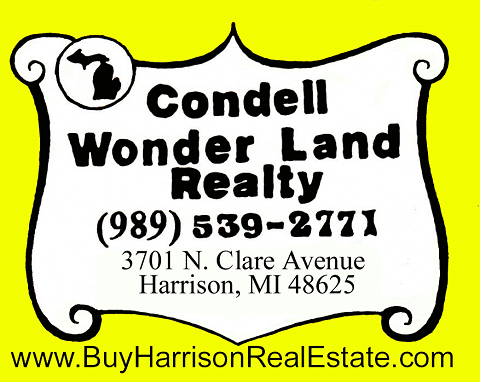 Condell Wonder Land Realty has a great selection of all types of Northern Michigan Real Estate and has been listing and selling Harrison MI. Real Estate for many years, so if you are looking to buy or sell property in Harrison, MI. please contact us!